On the closed cat eye in the picture, a small flat not scabby patch has formed. 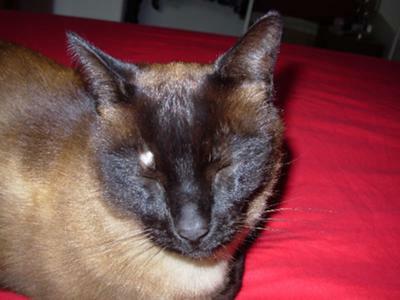 This is an indoor and outdoor cat, Siamese, behavior normal, no scratching or rubbing. Duration about 4 days. Thank you for your question and picture of the cat skin patch problem. Though the picture is not very helpful in identifying the problem (but thanks for trying), it seems that the coat over the skin, specifically the area around the eyes is dry and might be a bit flaky at the base of the surrounding hairs. A dry cat coat and possible hardness of the hair base is causing pressure on the eyelid. That's why it might remain closed. Based on what we can learn from the picture, it doesn't appear to be a major issue as the inner part of the eyes are not affected. However, be sure to look for certain signs that might represent an inner feline eye problem. Be sure to note problematic cat eye symptoms such as any cat eye discharge, redness around and over the eye surface and any possible swelling which hasn't yet matured. For cat eye problems, even if they are minor in nature, one should never follow a “wait & see” approach. It is preferable to have the problem examined by a veterinarian. Feline Eyes are delicate organs and any complication can cause permanent loss of function, which surely is unrecoverable. If possible, it is better to have the issue examined and to have preventive measures taken. Here, on the basis of our assumption, it is recommended that you use a quality shampoo for bathing your cat.. Preferably use a herbal shampoo containing chamomile, which will keep the skin & coat clear of any dryness at the base of the hair. One product to consider is Clean Cat Shampoo. Remember, these are supportive measures only, suggested on the basis of the information provided. Confirmation regarding the exact cause of the cat skin and eye condition can only be made through a detailed examination by your veterinarian. We hope these tips help your cat. Please keep us up to date on how you resolved the condition.